Salsas are the lifeblood of just about every Mexican dish. They can be cooked or raw, made in the blender or in a molcajete. Salsa can make or break any dish, add a special dimension of flavor or even make a dish edible (you wouldn’t eat chicharrón without cooking it in salsa to soften the dried meat). The simple combination of tomatoes (jitomate or tomatillos/red or green), chiles (of any variety) and other ingredients like onion, garlic and spices is essential to many traditional dishes in Mexican cuisine. 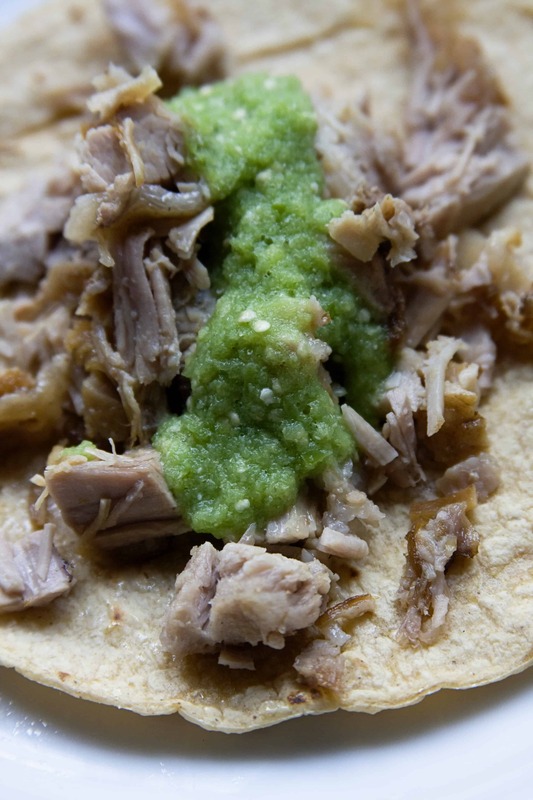 Salsa verde is certainly a staple in my house, whether it’s cooked and used for guisados like chicharrón en salsa verde, or raw salsa used for garnishing tacos. You’ll notice this same cooked salsa recipe will be used over and over again in a number of dishes you’ll read about here and I’ll reference back to it often and sometimes modify it (for example, when making chilaquiles, I substitute fresh chicken stock in place of water). In Mexico, we’ve eaten similar recipes to mine at many of our favorite restaurants, though some places use epazote in their cooked salsa (an ingredient I don’t use). In Chicago, we haven’t found a place that makes salsa verde the way we like it—or anywhere near it, really. Because of this, we sometimes order take out from our favorite Mexican restaurants and bring it home to eat it with our own homemade salsa. How to make Mexican cooked green salsa. First, remove the husks and wash the tomatillos well. You’ll notice they’re sticky, which is a sign of ripeness, and probably slightly dirty under the husk. Sometimes I find that warm water isn’t enough, and I use a few drops of dish soap diluted in a bowl of warm water. Then I put the husked tomatillos in the bowl and gently rub each one in the slightly soapy water to remove the dirt and sap. Rinse them well in cool water to remove any soap residue. 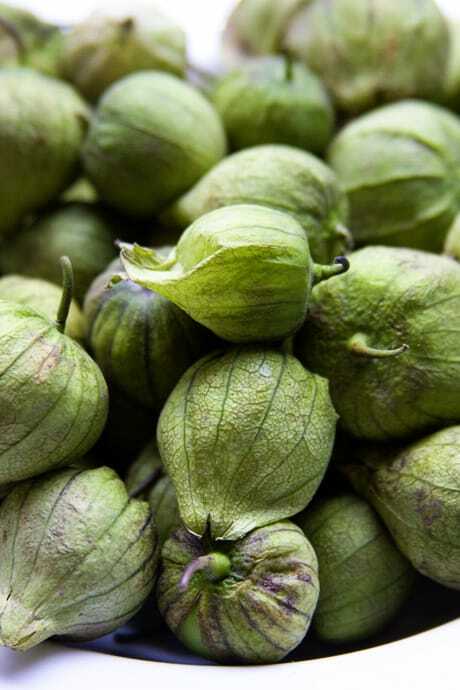 Fill a pot with water (large enough to fit all the tomatillos) and bring to a boil. Put the tomatillos in and cook in the boiling water until the tomatillo flesh begins to get transparent. Using a slotted spoon, transfer the tomatillos to a blender. Add the onion, garlic and salt. Cut the stems off the serrano chiles and cut each chile into a few pieces so they’re easily chopped in the blender. Start by adding 2 chiles to the blender with about ¾ of a cup of water and blend on high (liquify or puree) until smooth and the chiles and tomatillos are completely incorporated. Taste the salsa to see if it’s too hot; if it needs more chile, add them one at a time, blending & tasting the result until you are happy with the level of heat from the chiles. If it seems the salsa is not quite liquid enough, add another ¼ cup of water. The salsa will reduce slightly when cooked. Pour blender contents into a saucepan and heat over medium flame until the salsa boils, occasionally stirring. Remove from heat and allow to cool before storing in an airtight container in the refrigerator. Stores well in the refrigerator in an air-tight container for about 10 days. 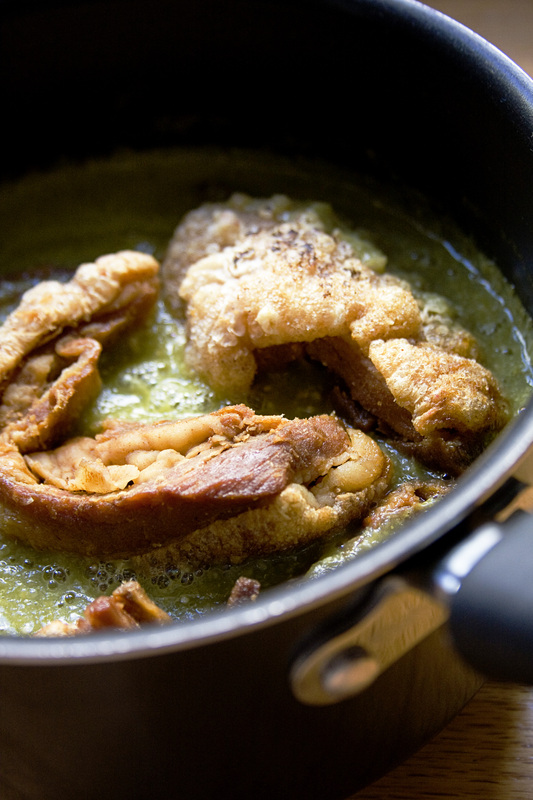 Tip: for extra flavor with salsa verde cocida, you can also add 2 strips of chicharrón (with meat still attached) to season the salsa. You should add the chicharrón during the end stage when you cook the salsa until it boils for a few minutes, then remove from heat and allow to come to room temperature before storing to infuse the chicharrón flavor. This flavor infusion method only works with the cooked salsa. Put the raw tomatillos directly into the blender with all other ingredients. Add the chiles to taste, starting with 2 and adding more if necessary. If it's too dry, add a few tablespoons of water to the ingredients and blend well until smooth. Serve immediately and store any leftovers in an air-tight container in the refrigerator for up to 3 days. Stores in an air-tight refrigerated container for up to 3 days. What do you do differently in making your salsas verdes or where is your favorite place to eat a dish that includes salsa verde? Hi, I usually do it a bit differently. For the salsa verde, I usually cook the chiles with the tomatillos and add cilantro and some pepper when combining everything into the blender. Oh, and yeah, I sometimes add epazote to it as well. Hi, Vee. Interesting that you cook the chiles…I will have to give that a try some time. I’ll confess here that I actually rarely cook with cilantro (gasp, I know!) because unless it’s cooked into the recipe and isn’t all that recognizable, the smell and taste of freshly ground cilantro makes me wretch. So you won’t see too many recipes here using it because of that, unfortunately. But we seem to get along just fine without it. On the other hand, I have nothing against epazote, and am open to experimenting with it. I just don’t use it in my salsa verde. Though the family friend who taught me the basics of salsa verde uses epazote in his recipe, and his is very similar-tasting to mine. Have you tried the cubes of powdered cilantro? I like using them I have a friend who absolutely won’t eat cilantro or anything with it in, but she chomps down on it if I use the cubes and she doesn’t know it is in there. Our salsa verde recipes are very similar, the only difference is that I use whole Jalapeños instead of the serrano chiles. I typically don’t add onion, but that sounds interesting. I will have to try your recipe. If it comes out tasting the same, then the less ingredients, the better. :o) Looking forward to some more recipes so I can try them out. I cook the chiles too. I was taught to make it with garlic instead of onion, and with a little Knorr caldo de pollo instead of salt. Salsa verde is my favorite, yum! Hi Jamy, I use both garlic and onion together in my recipe. I like that you use the Knorr; I know a lot of chefs look down on the use of it, but I think it’s a good substitute for salt when you need to also add a little flavor. (For instance, when I cook “plain” pork chops, I usually sprinkle just a little caldo de pollo on each side of the meat before I pan-cook them.) I don’t buy Knorr in the U.S. though because it doesn’t taste the same as the Knorr sold in Mexico. I buy a jar each of the caldo de pollo, caldo de tomate (which is both chicken and tomato-flavored) and caldo de res once or twice a year when I’m visiting Mexico. The stuff sold in the U.S. just doesn’t even taste right to me, it’s too salty and has a bit of a different flavor. I like to fire roast my peppers and I always remove the veins and seeds because I love the taste of salsa, but I don’t like when it’s so spicy you can’t even taste it. Also, I usually make my salsa in a molcajete. Given how hands-on I get with my peppers I have often made the mistake of rubbing my eyes too soon after handling them. Not a pleasant experience. This actually happened to me a couple months ago and my wife’s aunt told me to eat some salt to make the stinging go away. I so didn’t believe that would work but figured I had nothing to lose. Well, it worked. As soon as the salt touched my tongue the stinging in my eye went away and the watering stopped immediately. Oye Prado, you’re going to have to show me your salsa method when we get together next month to make champurrado. I agree I don’t like salsa when it’s so hot you can’t taste it. Serrano chiles are my comfortable heat-level, and I typically incorporate them one by one until I feel it’s spicy enough. Otherwise my husband will make it too spicy for my liking. Funny you mention rubbing your eyes…I’ve had a few close encounters recently! Actually, I make the mistake of chopping habaneros with bare hands (was out of rubber gloves) and thought that thoroughly wash my hands with soap and cool water when I was finished would be sufficient. A couple hours later, I wiped my hand over my forehead only to experience a positively awful burning sensation on my head for the next few hours. I kept checking the bathroom mirror to see if I had a big red raspberry spot on my forehead, it burned so much! Thankfully, there were no outer signs of my mistake. 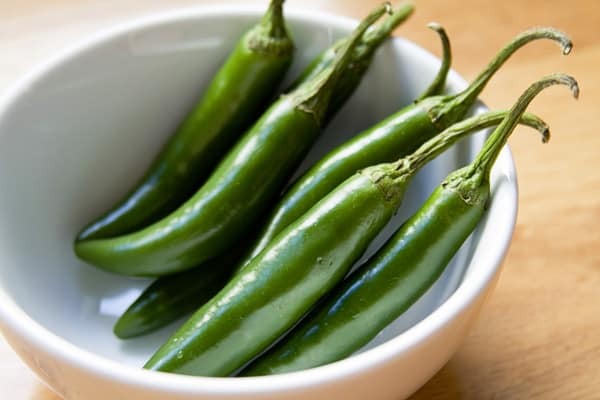 Another day last week I fire roasted some poblano chiles for rajas, and removed the seeds and veins by hand thinking they wouldn’t be that hot. Wrong. The backs of my hands were burning the rest of the day. Guess I’ll have to remember to keep a box of rubber gloves in the house! Thanks for the tip of eating salsa to make the stinging go away; I’ve never heard that before. (Though I have heard chewing gum while cutting onion will prevent you from crying.) Will have to keep salsa on hand on the days I’m likely to be cooking with chiles from now on–just in case.